In Portland, Oregon, John E. Marsh, DC, and William Powell, DC, were operating the Marsh School of Chiropractic, soon to be renamed Pacific Chiropractic College, a precursor of today's Western States Chiropractic College. Benedict Lust, MD, ND, considered the father of naturopathy in America, was operating his American School of Chiropractic alongside the American School of Naturopathy. In Dallas, Texas, Palmer graduate Andrew P. Davis, MD, DO, DC, was teaching, practicing and marketing his new book, Neurology, which sought to integrate theories and methods from the several health care disciplines he had studied. In far-off Melbourne, Australia, a short-course diplomate of the Palmer School of Chiropractic (PSC), Barbara Brake, was developing her pioneering practice down under. In September/October 1906, Willard Carver, LLB, DC, and L.L. Denny, DC, recent graduates of the Parker School of Chiropractic in Ottumwa, Iowa, established the Carver-Denny Kiropractic College at Oklahoma City. John F. A. Howard the ink barely dry on his PSC diploma (dated 17 August 1906), consented to a request from several Palmer students who, dissatisfied with the new president of the school, B.J. Palmer, DC, asked Howard to establish another chiropractic college in the profession's home city. Late in the year, with the explicit approval of "Old Dad Chiro," Howard founded the National School of Chiropractic. The new institution's first home was the same building in which D.D. Palmer had adjusted Harvey Lillard a decade earlier. The relationship between Old Dad Chiro and his son, B.J., had never been good, and the stress of the legal ordeal soured it further. The founder relinquished all interest in the Palmer School of Chiropractic, except for several books and part of the school's osteological collection, for the sum of $2,196.79. He moved to Medford, Okla., where his brother, Thomas J. Palmer, a newspaper publisher, would assist him in purchasing a small grocery store where he practiced chiropractic in his spare time until the spring of 1907. In August 1906, Palmer College establishes annual August homecoming parade. 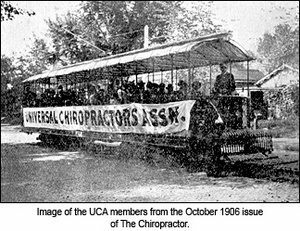 During the annual homecoming of the PSC, a protective legal society was established, the Universal Chiropractors' Association (UCA). The new organization involved membership dues paid to a central treasury, from which the costs of legal services would be paid when a chiropractor faced charges for unlicensed practice. The Universal Chiropractic Association had its first test when a Dr. Shegataro Morikobu of LaCrosse, Wisconsin, was arrested. Dr. B. J. Palmer and Lee Edwards went to assist. They engaged Mr. Tom Morris who was then the president of Wisconsin’s senate and he, with the aid of attorney Fred Hartwell, successfully defended the man, gaining a unanimous decision from the jurors. The UCA (forerunner of today's American Chiropractic Association) subsequently expanded its services to include legal defense in civil/malpractice suits, sponsorship of a professional journal, educational seminars and annual conventions held in conjunction with the PSC's homecomings. The first attempt to establish a national membership society, credit for which apparently belongs to the chiropractors of Minnesota and Solon M. Langworthy, DC, president of the ASC&NC. However, the UCA was the more enduring alliance and in 1930 would spawn the National Chiropractic Association (immediate predecessor of today's ACA). In early 1906 Dr. Dan Reisland of Minnesota employed a local lawyer to write a chiropractic licensing bill and asked his district’s legislator to introduce it, which he did. The bill passed both houses of the Minnesota legislature and went to the governor’s desk for signature. However, the governor vetoed it instead. It becomes the very first chiropractic law introduced into any state, the exact date is not known. On January 19, 1906, Dr. Walter H. Fischer was born at Buckholts, Milam County, Texas. He is a future Keeler Plaque recipient. In July 1906 future Keeler Plaque recipient Dr. John A. Kent had his first experience with chiropractic when his wife, "who suffered much from migraine headaches, went to Dr. Willard Carver, who with one Chiropractic adjustment cured her headaches. For years I had suffered from chronic bronchitis when I met Dr. Carver who adjusted my spine and to my amazement, I was entirely free of lumbar pain or discomfort in one week." Because of these experiences, Dr. Kent became greatly interested in Chiropractic and decided that he would enter the profession. He had become well acquainted with Dr. Carver, who informed him that he anticipated opening a Chiropractic College in Oklahoma City. Dr, Kent went to Oklahoma City determined to wait there until Dr. Carver came to establish his school. Dr. Denny preceded Dr. Carver to Oklahoma City and made the necessary arrangements for quarters for the school. Dr. 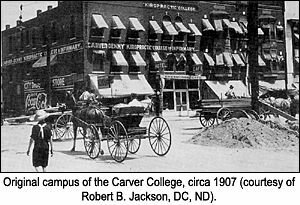 Carver arrived in October, 1906 and the Carver-Denny Chiropractic College was founded and I was the first student to matriculate there. Willard Carver Graduates from Parker Chiropractic school in Ottumwa, Iowa. Willard Carver "wrote the chiropractic licensing laws which were adopted verbatim by Arkansas and almost verbatim in Oklahoma. He submitted model laws in North Dakota, Iowa, and Kansas.... Oklahoma...got its law by a popular vote of the people, an election engineered by Carver and associates after they had been outmaneuvered in the Senate."